As principal bassoonist of the Boston Symphony Orchestra and a member of the Boston Symphony Chamber Players, I take part in myriad performances throughout the year at Symphony Hall and Jordan Hall in Boston and at Tanglewood in the Berkshires. Lovers of classical music in general should be sure to visit BSO.org for a complete listing of performances by these great ensembles. The following list is intended expressly for the use of those among you who are more discerning and particular in your tastes, those who crave a larger than normal dose of the bassoon with your musical intake. Please be advised that listening to bassoon playing can become an addictive behavior. If you should ever experience overwhelming cravings to hear bassoon music, you should satisfy these urges immediately. Failure to do so could lead to more destructive behaviors, like listening to music performed on the contrabassoon or even the accordion. A prudent person keeps a CD of bassoon music nearby at all times! November 8-13, 2018: Shostakovich Symphony No. 1. The Boston Symphony Orchestra, Andris Nelsons, conductor. Symphony Hall, Boston, MA. More info & Tickets. November 23-27, 2018: Beethoven Symphonies No. 4 & 5. The Boston Symphony Orchestra, Andris Nelsons, conductor. Symphony Hall, Boston, MA. More info & Tickets. March 7-9, 2019: Tchaikovsky Symphony No. 4. The Boston Symphony Orchestra, Thomas Adès, conductor. Symphony Hall, Boston, MA. More info & Tickets. March 20, 2019: Tchaikovsky Symphony No. 4. The Boston Symphony Orchestra, Thomas Adès, conductor. Carnegie Hall, New York, NY. More info & Tickets. April 5-9, 2019: Stravinsky Rite of Spring. The Boston Symphony Orchestra, Gustavo Dudamel, conductor. Symphony Hall, Boston, MA. More info & Tickets. April 25-30, 2019: Shostakovich Symphony No.15. The Boston Symphony Orchestra, Andris Nelsons, conductor. Symphony Hall, Boston, MA. More info & Tickets. May 2-4, 2019: Strauss Till Eulenspiegel’s Merry Pranks; Stravinsky Petrushka. The Boston Symphony Orchestra, Andris Nelsons, conductor. Symphony Hall, Boston, MA. More info & Tickets. January 13, 2019: Harbison Wind Quintet. The Boston Symphony Chamber Players. Jordan Hall, Boston, MA. More info & Tickets. February 3, 2019: Poulenc Sextet for Piano and Wind Quintet, Op. 100.The Boston Symphony Chamber Players with Garrick Ohlssohn, piano. Location TBD. More info & Tickets. March 3, 2019: Barber Summer Music for wind quintet; Michael Gandolfi Plain Song, Fantastic Dances for strings and winds. The Boston Symphony Chamber Players. Jordan Hall, Boston, MA. More info & Tickets. April 14, 2019: Francaix Dixtuor, for winds and strings; Beethoven Septet in E-flat for strings and winds, Op. 20. The Boston Symphony Chamber Players. Jordan Hall, Boston, MA. More info & Tickets. February 24, 2019: Mozart Concerto for Bassoon & Orchestra K191. The Quincy Symphony Orchestra. Lloyd Hill Performing Arts Center, Quincy, MA. More info & Tickets. 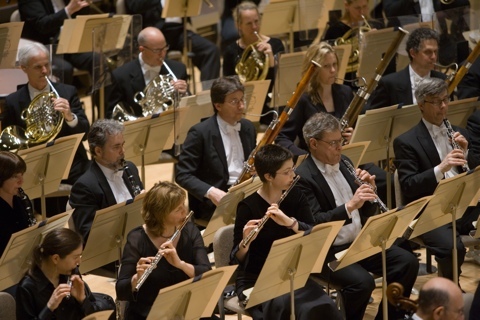 Photo of the Boston Symphony Orchestra winds ca. 2007 by Michael J. Lutch. Used with permission. Copyright © 2013-18 by Richard Svoboda. All rights reserved.